Back in the 1400's when the Portuguese were still searching for the sea route to India they rounded the Cape and many of the ships got caught in our winter storms and were wrecked. The Cape then got the name of the Cape of Storms . When the westerly wind comes screaming in from the Atlantic Ocean and brings with it the really bad weather that the Cape is renowned for shipping looks for somewhere to hide. Anchoring in Table Bay is normally reasonably safe but when a gale blows make sure that your anchor holds and you don't end up on the beach like the two ships I am going to tell you about in this article. 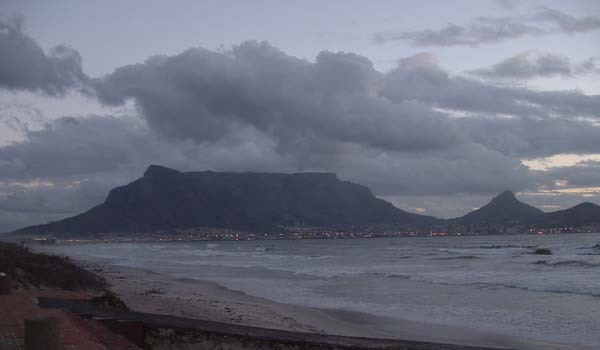 Back in 1773 on Sunday the 30th of May a storm blew up in Table Bay. The wind so strong that the ships in the bay had major problems with their anchors. The ship De Jonge Thomas was anchored in the bay with 207 people on board when the storm arrived. The wind was so strong that it broke the ship's anchor ropes and blew the ship aground on a sandbank off Woodstock beach. The then governor of the Cape sent 30 soldiers to the beach to see what they could do to assist in the rescue of the crew. Christiaan Ludwig Woltemade was one of the soldiers. While he was on the beach his father Wolraad Woltemade, a man aged between 60 and 70 years brought him some food. When Wolraad arrived on the beach and saw that nothing was being done by the soldiers to rescue the crew who were hanging onto the decks of the ship he decided to do something to help. He took his horse and rushed into the sea and swam it out to the ship where he had two crew members jump into the sea and hang onto his horse while it swam back to land dragging them to safety. Wolraad undertook this trip seven times bringing fourteen men to safety. Unfortunately on the eighth attempt so many sailors were keen to be rescued that they jumped into the sea and in their panic clung to the horse which by this time was exhausted and unable to pull them to safety. In the chaos that ensued the horse and Wolraad Woltemade disappeared under the waves and both lost their lives. Wolraad Woltemade became a hero and is remembered for his bravery. Today the 19th of August 2003 another ship �The Sealand Express � also found itself in trouble in Table Bay. Apparently the captain was warned by the port authorities that he was too close to the shore but took no notice of the warnings. During the night his anchor dragged and the westerly gale blew the ship onto the sand at Sunset Beach between Table View and Milnerton about a 150 metres from the shore. Sitting on the sand and being pounded by the waves, the ship which is heavily laden with containers looked a sorry sight. The tugs the Pacific Worker and the Pacific Brigand managed to attach two lines to the ship but with the tide going out and the wind blowing the ship onshore the lines broke when an attempt was made to pull her free. As there was no immediate danger to the crew of the ship they were left on board to look after the ship if and when she is pulled free. Three days later the ship is still sitting on its sand bank with no chance of being pulled off. As it is very heavily laden with containers and bunker oil it appears that these will have to be removed to lighten the ship. The sea is calm at present but should the weather turn foul there is a distinct possibility of pollution should the ship break up and release its oil into the ocean. There are a number of cold fronts forecast for the next couple of days and should the sea become rough the ship could be forced closer to the beach. It appears that the authorities are waiting for the next spring tide which is due next week to attempt to pull the ship off the sand. The water in the vicinity of the ship will apparently be a metre and a half deeper which will assist in lifting the ship off the sand. If this happens the chances are good that the ship will be refloated. Back in 1773 they were not so lucky as there were no tugs or helicopters to pull the ship off the sand and to rescue the crew. In 2003 the Cape of Storms has once again lived up to its tradition. Every winter it claims at least one ship along our coastline. When it does that there is normally oil pollution which kills many of our marine birds and oils up some of our beaches when the oil comes ashore. With a bit of luck we might be spared the pollution this time around. The Sealand Express was eventually pulled off the sand by three tugs. Read Sealand Express saga page for the whole story.